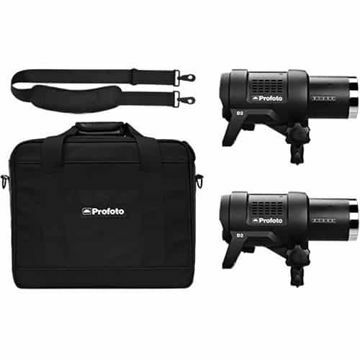 Having wowed us with the introduction of the battery-powered TTL B1 and B2 flash heads, Profotodoes it again with the AC-powered D2 500Ws AirTTLMonolight. Building on the foundation of the popular D1, this light maxes-out the D1 performance specs while adding wireless TTL from the B1 and B2. With the D2, "speed" is the operative word. The D2 500 recycles to full power in 0.6 seconds, almost half the time as the D1 500, and in Freeze Mode, achieves flash durations as short as 1/63,000 of a second, outperforming most studio pack systems. That's good news for special effects photographers and sports shooters. It can also shoot bursts of 20 flashes per second, so you're sure to capture peak action or several versions of it. In addition, the D2 also supports High Speed Sync up to 1/8000 of a second for photographers who want to stop action or use wide apertures with full ambient light control. The 10-stop power range gives ample choices to achieve your objective. Besides super-fast operation, the D2 shortens your shooting time with on-board TTL compatibility. Pros who formerly turned their noses up at the term "point-and-shoot" as amateurish will learn to love this technology. Simply set your lights up, set the camera to TTL and shoot. The first shot is nearly always a keeper. The key to this control is the optional Air Remote TTL-C (for Canon) or TTL-N (for Nikon). Operating on 2.4 GHz bandwidth, the wireless transmitter, really a controller, has 8 frequency channels and with 6 groups and a range of up to 330' for TTL triggering and 1000' for normal triggering. Each channel has power ratio capability of +/- 2 stops. If you prefer to use manual, you have 10 stops of power variation. The D2 also features an enhanced, intuitive LCD screen display. Modeling Light, Ready Indicator, Mode, Sync, Channel, and Group are easily selected through the Settings button. The display even flips around the way your iPhone does in case you're working with the head upside down or hanging it overhead. The D2 has a self-seeking multi-voltage (100-240) power supply for worldwide use, too. Profoto has covered so many features on the photographers wish list that you'll wonder what they can come up with next. The D2 can shoot up to 20 flashes per second. That's fast enough to catch the best of any moment. Ask your subject to jump, and you'll have 20 mid-air exposures to choose from. The D2 can provide super quick flash durations up to 1/63,000 of a second. Shoot a splash of water, and it will be frozen in midair. Point-and-shoot in TTL mode using the separately purchased Air Remote TTL-C (for Canon) or TTL-N (for Nikon). Switch to Manual mode and control the light with intuitive buttons and menus. The D2 packs enough punch to overpower the available light in almost any situation. Its power is also an advantage when shooting at longer distances or when using larger light shaping tools. Profoto High-Speed Sync (HSS) enables you to shoot with shutter speeds up to 1/8000 of a second. Use HSS to shoot with a wide aperture in bright conditions or to freeze action with absolute sharpness.